Ranil Sharma is a Core Energetics facilitator who has been running workshops and intensives for 15 years and working with people from around the world. His natural ability to engage and communicate with people and groups bring an extra dimension to the work. Ranil discovered Core Energetics as a participant while working in corporate life. Experiencing dramatic transformation inspired him to undertake the full 5 year therapist training, including a training with Dr John Pierrakos, founder of Core Energetics. 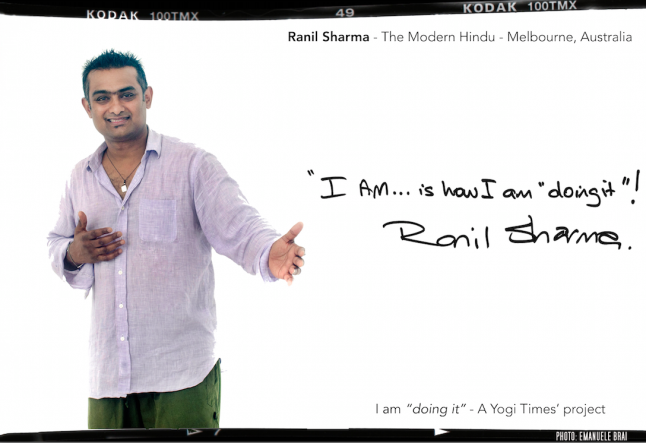 We invited him to be part of the Yogi Times “I AM DOING IT” project, asking him to share why and how he is “doing it”, that is raising consciousness with his skills and passion in so many communities, and to give us some light on Core Energetics. YT: Can you tell us what has led you to become a facilitator of these Core Energetics workshops? Ranil Sharma: As a young man working in a large corporate business, I was very fortunate to have the opportunity to look at a range of personal and professional development. My experience with team building and corporate performance fuelled a desire for personal growth. As my education evolved, I came across the Core Energetic work and very quickly realized that what I knew about myself up until then was the beginning and there was a quicker way to create lasting change. I watched lives change in front of me and was so inspired that I knew my life would change. My understanding had been of many of my symptoms and how to manage or force a different outcome cognitively. The dimensions of the body, consciousness, spirituality and emotion resonated deeply with me. As I participated in the work more deeply, I came to understand that in training to become a therapist, I would have the opportunity to deepen my own process. This was the main factor in my undertaking the training and running my private clinic. The group work (mini-workshops, workshops, intensives, retreats) is where I see the biggest changes and so are how I love to work. For me the Quantum Effect of this type of group is unique and lifechanging. We have all heard the catch phrases – Empowerment, Inspiration, Wealth, Power, Fastrack Success, Personal potential. These courses and seminars have a lot of valuable information. Many techniques are employed to re-program the mind to command power. The number of modalities available today are unlimited. They promise quick and permanent change. In many instances one can create willful (3rd chakra) change. Most people cannot sustain this. Why? How is it that we can put all our conscious energy and thoughts into something that either doesn’t happen or that does not fulfill us; in work/business or our personal lives? Do partners, family, friends, bosses, colleagues, staff react to us in ways that we can’t understand or change? Yet why does it happen? How do our brain and intellect, emotions, spirituality, body and energy systems play a part in who we are and what we create in our lives? Is there such a thing as co-incidence and/or luck? Seeing people finding peace and freedom around these things is part of my “Doing It”. YT: Why the name “Core Energetics”? Ranil Sharma: Core refers to “Heart” in latin and is an evolution of the research developed by a range of brilliant psychiatrists (Wilhelm Reich, Alexander Lowen, John Pierrakos, Carl Jung). Early last century some of the worlds’ leading psychiatrists noticed there was a very strong correlation between a persons' emotional state, their physical body and their bio-electromagnetic energy field. The more they worked with the body and energy field, the quicker and deeper were the results on a persons' emotional and spiritual health. Core Energetics has evolved as a system of body-oriented psychotherapy that bridges psychology and spirituality. It is a mode of healing that combines bodywork, psychotherapy, and spiritual process. It is widely renowned as the first western psychotherapeutic approach to incorporate the spiritual aspect of being with modern psychology and body psychotherapy. YT: What specific training is necessary to lead these workshops? Ranil Sharma: The Core Energetics training consists of a 4 year qualification and a 5th year that focuses on group facilitation. A major component of the training is the experiential learning and development. We are required to “practice” in our learning and to undertake significant group and private therapy outside of teaching time. YT: How would you introduce the Core Energetics to someone who has never heard of it? Ranil Sharma: Dr John Pierrakos (one of the psychiatrists who developed this work) describes the body as the laboratory of life. Every thought, feeling, perception and experience that we have is stored like an encyclopedia. Our conscious mind is maybe 10% of our psyche. The unconscious mind is actually the body and so the beliefs that limit us can best be accessed through the body and energy system. Of course many traditional cultures have looked at health this way. The Chinese (TCM) and the Indians (Ayurveda) are probably the best known, but most cultures followed a naturopathic and wholistic lifestyle approach to health. My work is a modern psychology / science approach. I will know a lot about someone within seconds of meeting them. Their body and energy fields tell me about their experiences, feelings, belief systems, strengths and struggles. YT: Really! So they don’t even need to tell you anything? Ranil Sharma: Not really. However, while I know a lot about them, I don’t know who they are. I still need to understand them and then the work we do can be more tailored to their specific needs. Consciously knowing about our issues and creating deep and lasting change can be two different things! For example, we all know someone who is needy and demanding right? Well even when they are trying to not be needy, we still find that we are tired being around them, we avoid them or maybe try and rescue them? YT: Sounds like me? Are you reading me now? Ranil Sharma: Just a general example – but I think that you can relate? The work I do will get to the real cause of this belief by bypassing the conscious mind (through the body and energy field) and re-educating the unconscious mind to a healthier reality. This work is about empowerment -taking responsibility for ourselves! A lot is done by the person themselves, in their own time and this allows us to go deeper when we meet. YT: What can you do about that? Ranil Sharma: In our example, there is a deep sense of not being enough and the person doesn’t know how to nurture themselves. This creates low self worth and an addictive personality which is constantly trying to feel better inside by “filling” it with something from outside. We get to a place where they can feel good about who they are and feel a sense of peace inside themselves. The anxiety will be gone and they have stopped analyzing everything. All of a sudden they can appreciate the things in their life instead of constantly wanting more or something else. The experience of life becomes very rich. YT: For what major reasons do people engage in a Core Energetics workshops? Ranil Sharma: Many of my clients are professionals (healthcare and business). Yes – every day people. They come to see me because they feel stuck in a particular area of their lives e.g career, relationship, finances. They are usually quite self aware and focused on their own development and really want to take it to another level. They are ready to take a deeper level of responsibility for their feelings and lives. Along the same lines, I have many clients that are about deepening their own life process – being more present, loving, in the moment and pro-active about their own spiritual and emotional growth. I deal with people that are suffering with emotional health issues (depression, anxiety, disassociation, etc...) and regularly work in conjunction with doctors, psychologists and related health professionals. I will have met with or assessed everyone prior to attending to help with preparation. In the case of people who have attended mini-workshops with me prior to the longer events, we will have already started and things will be identified that become the “intention” for the events. Ranil Sharma: For me I see miracles happen at every event - the change comes from every facet of our survival-based instincts, from people who are so withdrawn from the world to being totally present, from people who are caught up in an addictive personality to becoming strong and empowered, from people who have difficulty communicating to being open and finding ease to connect with people, others who are so wound up and analytical to being more spontaneous, or being so control-oriented and charismatic to being trusting and in the moment and allowing a sense of collaboration rather than everything being their way. This state of grounded spirituality then can be integrated into our every day experience of life and nurtured to create new experiental baselines. YT: Give us a quick understanding of what happens in a Core Energetics typical workshop? Ranil Sharma: The energy of a Group can enable a level of deep healing and change that truly represents the “Quantum Field”. The specific use of Group Energy in Core Energetic Body Psychotherapy allows us to jump to another level in our healing journey. The energy of the group will be “charged” and connected. Everybody will work with me individually in a process that is uniquely about them. We will utilize the energy of the group and, to the degree that each person is committed to stay present, everybody will participate in each individual process, taking the healing to an exponential level. YT: We were fascinated by what we saw and experienced but the workshop can be quite intimidating or confronting to a new person, especially since it is done in a group environment. How do new people cope with such intense energy and process work? Ranil Sharma: Every person is different and it is my job to assess, both prior to attendance and in the event, then to work with everyone to create an environment where they are safe enough to be affected by the work (and it’s intensity) and go deeper into their own process. There are many ways that this needs to be done to ensure the integrity and safety of everyone. YT: After each workshop, you mention the importance of not sharing what happens during your workshops with other people… Can you explain what is the purpose of that request? Ranil Sharma: The work we do is very deep and to the “Core” of peoples' belief systems and pain. It is extremely personal and we are able to do that by establishing a safe space. The safety can only be maintained with confidentiality. So our request is to NOT share the stories of what happened with others. Naturally we are deeply affected by others' processes and our own participation. We may wish to share this with our loved ones, etc and so there are some specific guidelines that we provide that maintain confidentiality while still allowing each of us to share our own individual experiences. YT: Dancing is a consistent part of the workshop, can you share a few words on that? Ranil Sharma: Sure – a key component in our work is to be grounded in the moment. There are a range of exercises that achieve this and music is a key. The frequencies, movement, group dynamics and energy enable a new Quantum memory that can be carried with us in our every day lives. Dancing moves the energy, re-connects the group (and individual), integrates the shifts as we go and builds the connections (to cover the main things). YT: Are there specific types of people or symptoms that would most benefit from your work? Ranil Sharma: : Let me answer that in another way if I may: I have had people ask me if there is anyone I can’t help and the answer is definitely yes - anyone who isn’t willing to be helped. The key component in any healing is intention: what is my intention? Who am I and how much do I want it? The Unconscious likes its comfort zone, even if that is a limiting place. Our survival instincts were great – we survived. However the repeating patterns that keep us unfulfilled stop us from truly living our lives. To truly “live”, we need a conscious intention to change the things that are keeping us in “survival”. We can learn new information, how to apply that into a new baseline in our lives that is natural and doesn’t need constant effort. YT: You speak about “The Science of Making Life Easy” – how does that work? Ranil Sharma: As we evolve our process through the work, life is in flow and feels “easy”. We feel all our emotions simultaneously and find a sense of inner peace and connection to our higher self, the universe (god), and others. There is a calmness that comes from feeling everything, including things that may have felt overwhelming or “bad”. There is a very clear science and methodology that gets us there. In the process there is also a tremendous amount of intuition, grace and connection. This phrase reminds me that they are the 2 sides of the same coin in our work. YT: I am curious – why do you call yourself the Modern Hindu? Ranil Sharma: I am a Hindu and grew up in a Brahmin family. My faith and spirituality were very strong. As I grew into adulthood, I found life was a challenge in how I experienced it. I found peace in spiritual practice but everyday life was challenging so I chose to actually be in it. Spiritual teachings spoke about detachment – which I could do. However when I came back into trying to connect then things wouldn’t really be fulfilling in relationships, work/career etc etc. My journey has allowed me to see how modern medicine and science combine with spirituality and my own faith. I feel that I live my Hindu faith and connection in ways that I rarely see – a modern hindu. I see the beauty of spiritual teachings and see how the work enables the ability to take them to amazingly new experiential levels – irrespective of the faith or religion. Ultimately my own belief is about connection, surrender and love. I feel grateful and blessed that I get to participate in this every day that I work. Contact Ranil via email here.